USDA's latest drought announcements, disaster updates, and US Drought Monitor and Impact Reporter information. USDA NRCS offers technical and financial resource programs to farmers and ranchers coping with drought. 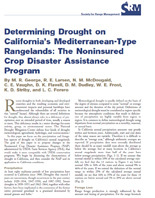 The USDA NRCS in California also provides information on conservation assistance for California farmers and ranchers. Drought information and resources for farmers, ranchers, and farmworkers. USDA information on the Risk Management Agency's (RMA) Pasture, Rangeland, and Forage (PRF) insurance program. Extensive guide for understanding and managing drought risk, including worksheets. 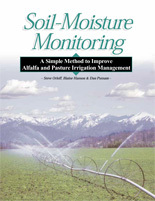 Outlines a simple method to improve irrigated pasture management, including interpreting soil moisture data, utilizing soil moisture data to guide irrigation decisions, and instillation/management recommendations.